This information is intended for individuals who will be appearing or wish to appear before a parliamentary committee of the House of Commons. 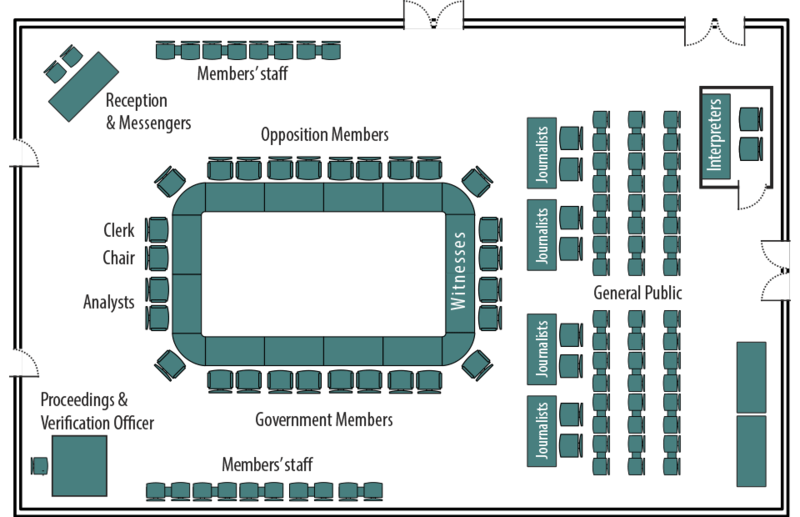 The House of Commons creates committees, which execute a large portion of parliamentary work. A committee is a working group constituted of a limited number of Members of Parliament (MPs) who study bills or issues, under the committee's mandate, in greater detail for the House of Commons. Committees regularly invite private citizens, experts, representatives of organizations, public servants and Ministers to appear before them in order to elicit information (receive evidence) relevant to the study under consideration. These consultations allow witnesses to set out and clarify their points of view, which are often presented in a written brief, and give MPs the opportunity to ask questions. Witnesses are generally consulted during public proceedings; however, committees may hear witnesses in private (in camera) if the situation warrants such action. Committees select witnesses based largely on the type of study and the amount of time available. The clerk of the committee then contacts the witnesses selected by the committee to establish the date, time and place of the meeting. A confirmation form is sent and witnesses must confirm, as quickly as possible, the names and titles of the people who will appear before the committee. When an organization is called upon to give evidence, it generally determines a representative to appear before the committee, although a committee may also request that a specific individual or office holder attend. Organizations should send to the meeting individuals who have the knowledge and expertise required to answer the MPs' questions. If a witness declines an invitation to appear, a committee may issue a summons to that witness, should the circumstances so require. Committee meetings in Ottawa take place in various buildings around Parliament Hill. It is recommended that witnesses arrive at the building entrance at least 30 minutes before their scheduled appearance in order to pass through airport-style security screening. Please note that photo identification is required. At the West Block, witnesses may use the “Parliamentary Business” line when accessing the building. Once through security, witnesses are asked to proceed to the meeting room at least 15 minutes before their scheduled appearance. The clerk will meet witnesses in the room. For various reasons, committees may decide to hear witnesses by videoconference rather than meeting with them in person. In such cases, witnesses will be invited to a site with the necessary equipment to host a videoconference. Witnesses will be given all necessary instructions and information (location, date, time) when they confirm their appearance. An appearance via videoconference has the same value, scope and protection as an in-person appearance. Sometimes a committee may travel beyond Parliament Hill to hold hearings. Witnesses will then be invited to the location of the meeting, usually a hotel, to present their testimony to the committee. Witnesses will be given all the necessary information (location, date, time) when they confirm their appearance. When witnesses must travel to give testimony before a committee, the committee will usually reimburse expenses, upon request, for persons appearing as individuals or for one or two witnesses per organization. Witnesses who wish to claim travel and other expenses related to the appearance must submit an expense claim form within 60 days of their appearance. The clerk of the committee will provide a link to the expense claim form upon confirmation of appearance. All parliamentary buildings and committee rooms are wheelchair-accessible. Staff will make every effort to accommodate all witnesses with special needs. Please contact the clerk of the committee to make the necessary arrangements. A brief is an opportunity to submit, in writing, opinions, observations and recommendations on a subject being considered by a committee. Any individual or organization can submit a brief to a committee, even if that person or organization has not had the opportunity to appear before the committee. Witnesses that appear before a committee are encouraged to submit a brief to support their presentation, but it is not mandatory for them to do so. For more information on the requirements for the submission of briefs, consult the Guide for Submitting Briefs to House of Commons Committees on the Committees' website or contact the clerk of the appropriate committee. Witnesses should submit to the clerk of the committee the documents regarding their appearance as soon as possible in advance of the meeting. In addition to the confirmation of appearance form, such documents may include a brief, speaking notes and reference material. The committee reserves the right to decide which documents that it receives will be translated and distributed to its members. If witnesses use speaking notes (even if they are handwritten), they must usually submit five copies to the clerk. These copies will assist with the simultaneous interpretation of the witness's testimony. Please note that if witnesses need to distribute documents to committee members at the meeting, the witnesses must submit the documents in both official languages to the clerk upon their arrival at the meeting room. The clerk can confirm before the meeting the exact number of copies required and will ensure the proper distribution of the documents if they meet the committee's requirements. If the documents are not available in both official languages at the time of the meeting, they will be distributed to committee members at a later date after they have been translated. Each organization or witness appearing as an individual has a limited amount of time (determined by the committee, but usually between 5 and 10 minutes) at the beginning of their testimony to make an opening statement. This time can be used to elaborate on the statements made in the written brief. Witnesses may use various tools (handwritten or typed notes, PowerPoint, etc.) to make it easier to deliver their opening statement to the committee. Upon advanced request, witnesses may also use audiovisual equipment during their presentation. The House of Commons will provide laptops with Microsoft Windows, with audio and Internet upon request, screens and projectors. Witnesses who wish to make use of this audiovisual equipment must inform the clerk of the committee when they confirm their appearance or at least five working days in advance of their appearance. The guidelines to this effect are provided with the confirmation of appearance. Please note that the requirement that all written material be delivered in both official languages also applies to the use of audiovisual tools. It is recommended that witnesses speak at a moderate pace since their testimony is being recorded, interpreted and transcribed. Witnesses can speak or answer questions in the official language of their choice (English or French) and simultaneous interpretation is available. After the witness's opening statement, members of the committee will ask questions. In every case, the Chair directs the meeting by turning the time over to members of the committee and witnesses. Please note that, traditionally, members of the committee should be addressed through the Chair. For example, "Thank you Mr. Chair. I would like to reply to the member that...". While a witness is not usually sworn in, the decision to swear in a witness is entirely at the discretion of the committee. A witness has the right to be accompanied by legal counsel; however, the role of the legal representative must be strictly advisory and the representative cannot ask questions or reply on behalf of the witness. When required, the witness may either swear an oath or make a solemn affirmation. Testimony before a parliamentary committee is protected by parliamentary privilege. This means that nothing said by a witness in his or her official testimony before a committee, whether it be in person or by videoconference, may be used in a court of law. This immunity does not apply if the same testimony is repeated publicly outside a parliamentary meeting. All public meetings are audio recorded or televised and the recordings are available on the committee’s website. The minutes of meetings and the transcripts of testimony (called "Evidence") are available on the Committees website, usually within 14 days. An unrevised transcript is usually available within 72 hours following a meeting, and can be provided by submitting a request to the clerk of the committee. The clerk of the committee is the chief procedural and administrative adviser to the Chair and to the members of the committee. The clerk organizes meetings and calls witnesses. The clerk will inform witnesses of the committee's requirements and the procedure for appearing before a committee. The committee analyst is the subject matter expert and can answer questions about the content and direction of the committee's study. You may find a committee's contact information on the Committees website.